Snowboard Slalom is one of the microgames in the Sports folder in WarioWare, Inc.: Mega Microgame$!. It returns as one of Dr. Crygor's microgames in WarioWare Gold, in which it uses gyro controls instead of buttons. 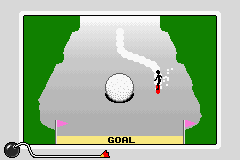 There is a top-down view of a ski slope, with a large snowball in the middle and a goal at the bottom. The player must steer the snowboarder, coming down from the top, around the snowball and into the goal. The microgame is won if the snowboarder makes it to the goal. However, hitting the snowball or any walls will cause players to fail the microgame. 1st level difficulty: The goal encompasses the entire bottom edge of the screen. 2nd level difficulty: The goal is a bit narrower (1/3 of the screen) and it is not always in the center. In WarioWare Gold, the obstacle is a snowman. 3rd level difficulty: The goal is very narrow (1/6 of the screen) and rarely in the center. In WarioWare Gold, the obstacle is a bear. The finish line is different in the European version of Mega Microgame$!, being a checkered line instead of spelling "goal" like in other versions. The checkered line pattern would later be used in all versions of Mega Party Game$ and WarioWare Gold. This page was last edited on March 9, 2019, at 13:24.